Coach Hire Lucca - Bus Charter Lucca - Bus Service Lucca! If you’re heading to Lucca in Italy, then there will be no shortage of amazing things to do and see. 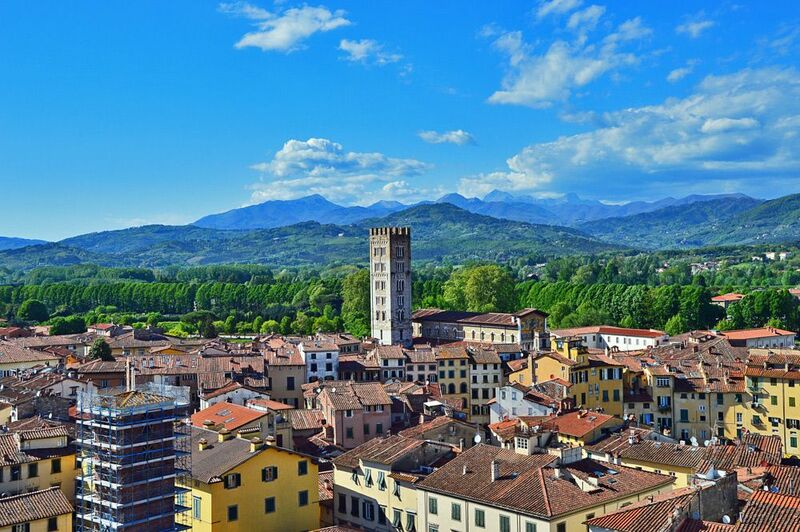 You can go to the Guinigi Tower, you can explore Piazza dell’ Anfiteatro, or you can see the Cathedral. How about taking a boat up the Serchio river? All this while soaking up the sunshine and the beautiful Italian countryside. It doesn’t get much better, which is why so many people pick Italy for their travels. But if you’re going to get the most from your visit, then you need to think carefully about how you’re going to get around. This may well prove to be the biggest factor in determining whether you have a dream trip, or a holiday from hell! The good news is that there is a simple answer: coach hire Lucca. By using coach hire in the area, you’ll be able to explore these sites, enjoy the time in between, and avoid many pitfalls that ensnare a lot of other holiday makers. Read on to find out why coach hire Lucca might be the perfect option for you, and how to use it to have the best trip possible. When it comes to accommodation, you can choose to stay in a hotel, or you can rent a villa or an AirBnB While both have their benefits, the latter two options will give you a more authentic experience and will provide you with more freedom. That’s because you’ll be able to live amongst the people, buy food at the local supermarket, go for walks, or just hang out in a traditional Italian home. All this makes the holiday that much more enjoyable and turns it into more of an adventure, rather than a kind of commercial experience. The same is true when you pick private coach hire Lucca, as opposed to using laid on transport set up by your holiday company or hotel. You’re now able to travel when and where you want, to see the parts of the country that aren’t typically considered touristy, and to experience the beautiful countryside. You’re now free to not only take arranged excursions, but to visit nearby small towns, or drive around the countryside. Or you can take a much longer ride and see other parts of the country like Sienna. Heck, you can even take coach hire Lucca and visit Rome – it might take all day and you might need to book additional accommodation, but that’s the freedom that comes from this type of travel! Meanwhile, the journey itself will be far more enjoyable when you choose coach hire Lucca. Our coaches are among the most luxurious in the business, and they have all the modern trappings that you might be looking for. That means fold-out tables for a laptop, power points to keep you powered up, and it means that you get things like WiFi, a cool place to store drinks, and lots of leg room where you can keep your shopping. What’s more, is that our drivers are friendly, fun, and accommodating. What does all this mean? It means that if you want the driver to pull over somewhere so you can get out and have a photograph in front of a stunning vista… well you only have to ask! And it means that if you want to take a trip somewhere at night in order to avoid the queues… again, that’s entirely within the realms of possibility. And it’s this latter kind of option that makes for the truly amazing moments. There’s something incredible about seeing the sights at night or during sun rise. No other tourists are around yet, and you can enjoy these beautiful settings during that magical golden light. Not your cup of tea? Then how about planning a trip that involves a stop off along the way for a picnic somewhere truly scenic? Again, these are your options when you have coach hire Lucca on your side. Then there’s the fact that coach hire Lucca is for everyone. What do we mean by that? Simply that this isn’t just a treat for those on holiday looking to see the sights and spend time with friends and family. It’s also a great option for those that want to make an organized group trip as part of a walking group, or as part of a religious retreat. Maybe you want to take a school trip? In these scenarios, coach hire Lucca is ideal because you can keep everyone together, avoid anyone getting lost, and not have to navigate the stressful and complicated public transport when you don’t understand the language! It’s also an ideal option for those on stag or hen parties. This way you can enjoy a trip that will give you plenty of option to spend laugh and joke during the journeys, and you can ensure that you have a safe and easy way to get home if you have a night out and drink a few too many. Coach hire Lucca can also be used by businesses looking to outsource travel and make a profit. If you’re offering an attraction or a trip in Italy, then why not hire our services? You can split the costs between your customers and charge them a fair rate, while still making a profit. We’re affordable, reliable, and we will always represent your business in the best possible manner. In short, anyone looking to make the most from their travel will do well to use coach hire Lucca. That’s especially true for the sight seers and those who want to properly and fully experience the location they’re travelling to. Don’t ‘cheat’ on your holiday: actually explore and book your own routes. The good news is that with coach hire Lucca, this doesn’t have to come at the expense of luxury and comfort – in fact it’s even more comfortable and luxurious! Don’t hesitate, get booking today!